Earlier today the Aliens: Colonial Marines website was changed to state that the game would be coming out in Fall 2012. It wasn't just a simple error by a web designer. Tonight Sega sent out a statement confirming and explaining the delay to the squad-based shooter. "Aliens: Colonial Marines is a process of creativity and invention and those don't necessarily follow the structure of an assembly line. While setting clear goals, deadlines and predictions is helpful, they are often subjective," said Sega. "We don't want to sacrifice the creative process just for the sake of following a blue print. We prefer to have the creative discovery shape that blue print because our goal is to make a great game, and we are prioritising this goal over the previously targeted date." Shorter version: polish. Can you blame them? The game's been in development since 2006 so expectations are high. The fact that the game is based on an extremely popular franchise makes the pressure on Sega and developer Gearbox all the greater. 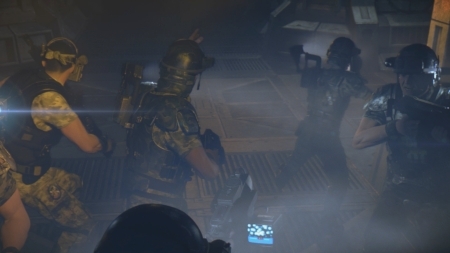 The official Colonial Marines site was changed back to Spring 2012, the previous release window for the game, this afternoon after word broke of the possible delay. I imagine the folks over at Sega must've panicked at the wave of news articles. Fun day to work in public relations, no doubt. As previously stated, this might have an effect on Gearbox's other upcoming co-op shooter, Borderlands 2. It seems unlike that they would release both B2 and Colonial Marines in close proximity. Thus, we'll probably have to wait until the beginning of 2013 for the former to arrive. There's a bit of good news to balance out the bad, though. A new trailer for Marines will debut tomorrow according to Gearbox community manager Chris Faylor. A screenshot from the trailer is below. Update: The trailer is now available. Check it out here.